For other uses, see Theseus (disambiguation). Theseus (UK: /ˈθiːsjuːs/, US: /ˈθiːsiəs/; Ancient Greek: Θησεύς [tʰɛːsěu̯s]) was the mythical king and founder-hero of Athens. Like Perseus, Cadmus, or Heracles, Theseus battled and overcame foes that were identified with an archaic religious and social order: “This was a major cultural transition, like the making of the new Olympia by Hercules” (Ruck & Staples, p. 204). Theseus was a founding hero for the Athenians in the same way that Heracles was the founding hero for the Dorians. The Athenians regarded Theseus as a great reformer; his name comes from the same root as θεσμός (thesmos), Greek for "The Gathering". The myths surrounding Theseus – his journeys, exploits, and friends – have provided material for fiction throughout the ages. Theseus was responsible for the synoikismos ("dwelling together") – the political unification of Attica under Athens – represented emblematically in his journey of labours, subduing ogres and monstrous beasts. Because he was the unifying king, Theseus built and occupied a palace on the fortress of the Acropolis that may have been similar to the palace that was excavated in Mycenae. Pausanias reports that after the synoikismos, Theseus established a cult of Aphrodite Pandemos ("Aphrodite of all the People") and Peitho on the southern slope of the Acropolis. Plutarch's Life of Theseus (a literalistic biography) makes use of varying accounts of the death of the Minotaur, Theseus' escape, and the love of Ariadne for Theseus. Plutarch's sources, not all of whose texts have survived independently, included Pherecydes (mid-fifth century BC), Demon (c. 400 BC), Philochorus, and Cleidemus (both fourth century BC). As the subject of myth, the existence of Theseus as a real person has not been proven, but scholars believe that he may have been alive during the Late Bronze Age possibly as a king in the 8th or 9th century BC. Aegeus, one of the primordial kings of Athens, was childless. Desiring an heir, he asked the Oracle of Delphi for advice. Her cryptic words were "Do not loosen the bulging mouth of the wineskin until you have reached the height of Athens, lest you die of grief." Aegeus did not understand the prophecy and was disappointed. He asked the advice of his host Pittheus, king of Troezen. Pittheus understood the prophecy, got Aegeus drunk, and gave Aegeus his daughter Aethra. But following the instructions of Athena in a dream, Aethra left the sleeping Aegeus and waded across to the island of Sphairia that lay close to Troezen's shore. There she poured a libation to Sphairos (Pelops' charioteer) and Poseidon, and was possessed by the sea god in the night. The mix gave Theseus a combination of divine as well as mortal characteristics in his nature; such double paternity, with one immortal and one mortal, was a familiar feature of other Greek heroes. After Aethra became pregnant, Aegeus decided to return to Athens. Before leaving, however, he buried his sandals and sword under a huge rock and told Aethra that when their son grew up, he should move the rock, if he were heroic enough, and take the tokens for himself as evidence of his royal parentage. In Athens, Aegeus was joined by Medea, who had left Corinth after slaughtering the children she had borne, and had taken Aegeus as her new consort. Priestess and consort together represented the old order in Athens. Thus Theseus was raised in his mother's land. When Theseus grew up and became a brave young man, he moved the rock and recovered his father's tokens. His mother then told him the truth about his father's identity and that he must take the sword and sandals back to king Aegeus to claim his birthright. 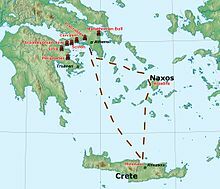 To journey to Athens, Theseus could choose to go by sea (which was the safe way) or by land, following a dangerous path around the Saronic Gulf, where he would encounter a string of six entrances to the Underworld, each guarded by a chthonic enemy. Young, brave, and ambitious, Theseus decided to go alone by the land route and defeated a great many bandits along the way. At the first site, which was Epidaurus, sacred to Apollo and the healer Asclepius, Theseus turned the tables on the chthonic bandit, Periphetes, the Club Bearer, who beat his opponents into the Earth, taking from him the stout staff that often identifies Theseus in vase-paintings. At the Isthmian entrance to the Underworld was a robber named Sinis, often called "Pityokamptes" (Greek: Πιτυοκάμπτης, "he who bends Pinetrees"). He would capture travellers, tie them between two pine trees that were bent down to the ground, and then let the trees go, tearing his victims apart. Theseus killed him by his own method. He then became intimate with Sinis's daughter, Perigune, fathering the child Melanippus. In another deed north of the Isthmus, at a place called Crommyon, he killed an enormous pig, the Crommyonian Sow, bred by an old crone named Phaea. Some versions name the sow herself as Phaea. The Bibliotheca by Pseudo-Apollodorus described the Crommyonian Sow as an offspring of Typhon and Echidna. Near Megara, an elderly robber named Sciron forced travellers along the narrow cliff-face pathway to wash his feet. While they knelt, he kicked them off the cliff behind them, where they were eaten by a sea monster (or, in some versions, a giant turtle). Theseus pushed him off the cliff. Another of these enemies was Cercyon, king at the holy site of Eleusis, who challenged passers-by to a wrestling match and, when he had beaten them, killed them. Theseus beat Cercyon at wrestling and then killed him instead. The last bandit was Procrustes the Stretcher, who had two beds, one of which he offered to passers-by in the plain of Eleusis. He then made them fit into it, either by stretching them or by cutting off their feet. Since he had two beds of different lengths, no one would fit. Theseus turned the tables on Procrustes, cutting off his legs and decapitating him with his own axe. When Theseus arrived at Athens, he did not reveal his true identity immediately. Aegeus gave him hospitality but was suspicious of the young, powerful stranger's intentions. 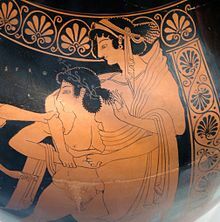 Aegeus's wife Medea recognised Theseus immediately as Aegeus' son and worried that Theseus would be chosen as heir to Aegeus' kingdom instead of her son Medus. She tried to arrange to have Theseus killed by asking him to capture the Marathonian Bull, an emblem of Cretan power. On the way to Marathon, Theseus took shelter from a storm in the hut of an ancient woman named Hecale. She swore to make a sacrifice to Zeus if Theseus were successful in capturing the bull. Theseus did capture the bull, but when he returned to Hecale's hut, she was dead. In her honour Theseus gave her name to one of the demes of Attica, making its inhabitants in a sense her adopted children. When Theseus returned victorious to Athens, where he sacrificed the Bull, Medea tried to poison him. At the last second, Aegeus recognised the sandals and the sword, and knocked the poisoned wine cup from Theseus's hand. Thus father and son were reunited, and Medea, it was said, fled to Asia. Pasiphaë, wife of King Minos of Crete, had several children. The eldest of these, Androgeos, set sail for Athens to take part in the Panathenaic Games, which were held there every four years. Being strong and skilful, he did very well, winning some events outright. He soon became a crowd favourite, much to the resentment of the Pallantides who assassinated him, incurring the wrath of Minos. When King Minos heard what had befallen his son, he ordered the Cretan fleet to set sail for Athens. Minos asked Aegeus for his son's assassins, and if they were to be handed to him, the town would be spared. However, not knowing who the assassins were, King Aegeus surrendered the whole town to Minos' mercy. His retribution was that, at the end of every Great Year, which occurred after every seven cycles on the solar calendar, the seven most courageous youths and the seven most beautiful maidens were to board a boat and be sent as tribute to Crete, never to be seen again. In another version, King Minos had waged war with the Athenians and was successful. He then demanded that, at nine-year intervals, seven Athenian boys and seven Athenian girls were to be sent to Crete to be devoured by the Minotaur, a half-man, half-bull monster that lived in the Labyrinth created by Daedalus. On the third occasion, Theseus volunteered to talk to the monster to stop this horror. He took the place of one of the youths and set off with a black sail, promising to his father, Aegeus, that if successful he would return with a white sail. Like the others, Theseus was stripped of his weapons when they sailed. On his arrival in Crete, Ariadne, King Minos' daughter, fell in love with Theseus and, on the advice of Daedalus, gave him a ball of thread (a clew), so he could find his way out of the Labyrinth. That night, Ariadne escorted Theseus to the Labyrinth, and Theseus promised that if he returned from the Labyrinth he would take Ariadne with him. As soon as Theseus entered the Labyrinth, he tied one end of the ball of string to the door post and brandished his sword which he had kept hidden from the guards inside his tunic. Theseus followed Daedalus' instructions given to Ariadne; go forwards, always down and never left or right. Theseus came to the heart of the Labyrinth and also upon the sleeping Minotaur. The beast awoke and a tremendous fight then occurred. Theseus overpowered the Minotaur with his strength and stabbed the beast in the throat with his sword (according to one scholium on Pindar's Fifth Nemean Ode, Theseus strangled it). After decapitating the beast, Theseus used the string to escape the Labyrinth and managed to escape with all of the young Athenians and Ariadne as well as her younger sister Phaedra. Then he and the rest of the crew fell asleep on the beach of the island of Naxos, where they stopped on their way back, looking for water. Athena woke Theseus and told him to leave early that morning and to leave Ariadne there for Dionysus, for Naxos was his island. Stricken with distress, Theseus forgot to put up the white sails instead of the black ones, so his father, the king, believing he was dead, committed suicide, throwing himself off a cliff of Sounio and into the sea, thus causing this body of water to be named Aegean Sea. Dionysus later saw Ariadne crying out for Theseus and took pity on her and married her. According to Plutarch's Life of Theseus, the ship Theseus used on his return from Crete to Athens was kept in the Athenian harbour as a memorial for several centuries. The ship had to be maintained in a seaworthy state, for, in return for Theseus's successful mission, the Athenians had pledged to honour Apollo every year henceforth. Thus, the Athenians sent a religious mission to the island of Delos (one of Apollo's most sacred sanctuaries) on the Athenian state galley – the ship itself – to pay their fealty to the god. To preserve the purity of the occasion, no executions were permitted between the time when the religious ceremony began to when the ship returned from Delos, which took several weeks. To preserve the ship, any wood that wore out or rotted was replaced; it was, thus, unclear to philosophers how much of the original ship actually remained, giving rise to the philosophical question whether it should be considered "the same" ship or not. Such philosophical questions about the nature of identity are sometimes referred to as the Ship of Theseus Paradox. Regardless of these issues, Athenians preserved the ship. Their belief was that Theseus had been an actual, historic figure and the ship gave them a tangible connection to their divine providence. Theseus's best friend was Pirithous, prince of the Lapiths. Pirithous had heard stories of Theseus's courage and strength in battle but wanted proof so he rustled Theseus's herd of cattle and drove it from Marathon and Theseus set out in pursuit. Pirithous took up his arms and the pair met to do battle but were so impressed with each other they took an oath of friendship and joined the hunt for the Calydonian Boar. In Iliad I, Nestor numbers Pirithous and Theseus "of heroic fame" among an earlier generation of heroes of his youth, "the strongest men that Earth has bred, the strongest men against the strongest enemies, a savage mountain-dwelling tribe whom they utterly destroyed." No trace of such an oral tradition, which Homer's listeners would have recognised in Nestor's allusion, survived in literary epic. Later, Pirithous was preparing to marry Hippodamia. The centaurs were guests at the wedding feast, but got drunk and tried to abduct the women, including Hippodamia. The Lapiths won the ensuing battle. 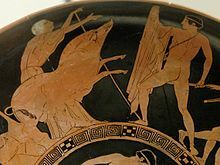 In Ovid's Metamorphoses Theseus fights against and kills Eurytus, the "fiercest of all the fierce centaurs" at the wedding of Pirithous and Hippodamia. Theseus, a great abductor of women, and his bosom companion, Pirithous, since they were sons of Zeus and Poseidon, pledged themselves to marry daughters of Zeus. Theseus, in an old tradition, chose Helen, and together they kidnapped her, intending to keep her until she was old enough to marry. Pirithous chose Persephone. They left Helen with Theseus's mother, Aethra at Aphidna, whence she was rescued by the Dioscuri. On Pirithous' behalf they travelled to the underworld, domain of Persephone and her husband Hades. As they wandered through the outskirts of Tartarus, Theseus sat down to rest on a rock. As he did so he felt his limbs change and grow stiff. He tried to rise but could not. He was fixed to the rock. As he turned to cry out to his friend, he saw that Pirithous too was crying out. Around him gathered the terrible band of Furies with snakes in their hair, torches and long whips in their hands. Before these monsters the hero's courage failed and he was led away to eternal punishment. For many months in half darkness, Theseus sat immovably fixed to the rock, mourning for both his friend and for himself. In the end he was rescued by Heracles who had come to the underworld for his 12th task. There he persuaded Persephone to forgive him for the part he had taken in the rash venture of Pirithous. So Theseus was restored to the upper air but Pirithous never left the kingdom of the dead, for when he tried to free Pirithous, the underworld shook. When Theseus returned to Athens, he found that the Dioscuri had taken Helen and Aethra to Sparta. Phaedra, Theseus's second wife and the daughter of King Minos, bore Theseus two sons, Demophon and Acamas. While these two were still in their infancy, Phaedra fell in love with Hippolytus, Theseus's son by the Amazon queen Hippolyta. According to some versions of the story, Hippolytus had scorned Aphrodite to become a follower of Artemis, so Aphrodite made Phaedra fall in love with him as punishment. He rejected her out of chastity. Alternatively, in Euripides' version, Hippolytus, Phaedra's nurse told Hippolytus of her mistress's love and he swore he would not reveal the nurse as his source of information. To ensure that she would die with dignity, Phaedra wrote to Theseus on a tablet claiming that Hippolytus had raped her before hanging herself. Theseus believed her and used one of the three wishes he had received from Poseidon against his son. The curse caused Hippolytus' horses to be frightened by a sea monster, usually a bull, and drag their rider to his death. Artemis would later tell Theseus the truth, promising to avenge her loyal follower on another follower of Aphrodite. In a version by Seneca, the Roman playwright, entitled Phaedra, after Phaedra told Theseus that Hippolytus had raped her, Theseus called upon Neptune (as he did Poseidon in Euripides' interpretation) to kill his son. Upon hearing the news of Hippolytus' death at the hands of Neptune's sea monster, Phaedra committed suicide out of guilt, for she had not intended for Hippolytus to die. In yet another version, Phaedra simply told Theseus Hippolytus had raped her and did not kill herself. Dionysus sent a wild bull which terrified Hippolytus's horses. According to some sources, Theseus also was one of the Argonauts, although Apollonius of Rhodes states in the Argonautica that Theseus was still in the underworld at this time. Both statements are inconsistent with Medea being Aegeus' wife by the time Theseus first came to Athens. With Phaedra, Theseus fathered Acamas, who was one of those who hid in the Trojan Horse during the Trojan War. Theseus welcomed the wandering Oedipus and helped Adrastus to bury the Seven Against Thebes. Lycomedes of the island of Skyros threw Theseus off a cliff after he had lost popularity in Athens. In 475 BC, in response to an oracle, Cimon of Athens, having conquered Skyros for the Athenians, identified as the remains of Theseus "a coffin of a great corpse with a bronze spear-head by its side and a sword." (Plutarch, Life of Cimon, quoted Burkert 1985, p. 206). The remains found by Cimon were reburied in Athens. The early modern name Theseion (Temple of Theseus) was mistakenly applied to the Temple of Hephaestus which was thought to be the actual site of the hero's tomb. Sophocles' tragedy Oedipus at Colonus features Theseus as a major character. Euripides' tragedy Hippolytus and Seneca's Phaedra revolve around the death of Theseus' son. In Geoffrey Chaucer's epic chivalric romance "The Knight's Tale," one of the Canterbury Tales, Theseus is duke of Athens, husband of Ypolita, and protector of Emelye, Ypolita's sister, for whom the two knights of Thebes, Arcite and Palamon, do battle. 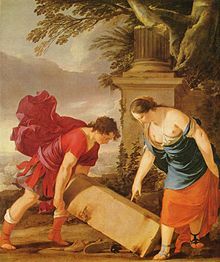 Racine's Phèdre (1677) features Theseus as well as Hippolytus and the title character Phaedra. Theseus is a prominent character as the Duke of Athens in William Shakespeare's plays, A Midsummer Night's Dream and The Two Noble Kinsmen. Hippolyta also appears in both plays. F. L. Lucas's epic poem Ariadne (1932) is an epic reworking of the Labyrinth myth: Aegle, one of the sacrificial maidens who accompany Theseus to Crete, is Theseus's sweetheart, the Minotaur is Minos himself in a bull-mask, and Ariadne, learning on Naxos of Theseus's earlier love for Aegle, decides to leave him for the Ideal [Dionysus]. André Gide's 1946 Thésée is a fictional autobiography where the mythical hero of Athens, now elderly, narrates his life story from his carefree youth to his killing of the Minotaur. Mary Renault's The King Must Die (1958) is a dramatic retelling of the Theseus legend from his childhood in Troizen until the return from Crete to Athens. While fictional, it is generally faithful to the spirit and flavor of the best-known variations of the original story. The sequel is The Bull from the Sea (1962), about the hero's later career. Evangeline Walton's 1983 historical fiction novel The Sword is Forged chronicles the story of Theseus and Antiope. Stephen Dobyns, wrote the poem Theseus within the Labyrinth (1986) which provides a retelling of the myth of Ariadne, Theseus and the Minotaur, in particular the feelings of Ariadne. In issue No. 12 of Fright Night comics, entitled Bull-Whipped, Theseus and the Minotaur are resurrected by the comic's Aunt Claudia Hinnault, who is the reincarnation of Ariadne. Kir Bulychov's 1993 book An Attempt on Theseus' Life (Покушение на Тезея) is about a plot to assassinate a man during a virtual reality tour in which he lives through Theseus' life. Troy Denning's 1996 novel Pages of Pain features an amnesic Theseus fighting to recover his past while interacting with some of the more colourful beings of the Planescape universe. 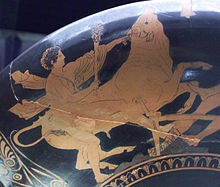 Steven Pressfield's 2002 novel Last of the Amazons attempts to situate Theseus's meeting and subsequent marriage to Antiope, as well as the ensuing war, in a historically plausible setting. Jorge Luis Borges presents an interesting variation of the myth in a short story, "La Casa de Asterión" ("The House of Asterion"). British comedian Tony Robinson wrote a version of the Theseus story entitled Theseus: Super Hero. Author Suzanne Collins was inspired by Theseus to write The Hunger Games trilogy, which was published from 2008 to 2010. Thésée (1675) is an early French opera by Jean-Baptiste Lully to a libretto by Philippe Quinault, based on Ovid. Teseo (1713) is an opera seria by George Frideric Handel to a libretto by Nicola Francesco Haym, based on Quinault. The opera Hippolyte et Aricie (1733) by Jean-Philippe Rameau, based on Racine, features Theseus as a character. Theseus is played by Bob Mathias in the 1960 film Minotaur, the Wild Beast of Crete, and by Tom Hardy in the 2006 film Minotaur. The first episode of the 2001 children's television series MythQuest, entitled "Minotaur," features a story in which the modern day teen-aged protagonist finds himself unexpectedly thrust into Theseus' role and must follow through with the events of the existing myth, including slaying the Minotaur with the help of Ariadne and Daedalus. [better source needed] The storyline was also adapted into a novelisation. In the 2003 miniseries Helen of Troy, Theseus, played by Stellan Skarsgård, kidnaps Helen with Pirithous and waits for her to reach marriageable age; however, he is slain by Pollux and she is returned to Sparta. In the 2007 video game God of War 2, Theseus, voiced by Paul Eiding, serves as a guardian to the Sisters of Fate. He wears a bronze armband that serves as a key across the Sisters lair. In the film Immortals (2011), directed by Tarsem Singh, Theseus, played by Henry Cavill, leads a war against King Hyperion of Heraklion, played by Mickey Rourke. The Indian film Ship of Theseus (2012) directed by Anand Gandhi, is an exploration of the philosophical idea underlying the myth. In the Canadian television series, Continuum (2012–2015), the leader of an anti-corporate human rights/terrorist group is called Theseus. In 2013, the BBC series Atlantis was released. In the first episode of season one, The Earth Bull, Jason enters the labyrinth. He is helped by Ariadne to slay him, as the myth of the Minotaur. Jason is based on the characters of Theseus, Perseus and the myth of Jason And The Argonauts. In Season 2 Part 1, Medea is introduced. Pasiphaё seeks to take back Atlantis after Ariadne is made Queen. The plot seems to be leading to Jason and The Argonauts. In Canadian/British television series Olympus (2015), the main character 'Hero' is loosely based on the myths of Theseus. The show follows Hero's quest to unlock the 'Lexicon', the door to Olympus, and to stop the apocalypse as foreseen by the Oracle of Gaia. ^ Carl A.P. Ruck & Danny Staples. (1994). The World of Classical Myth, ch. ix, "Theseus: Making the New Athens", pp 203–222. Durham, NC: Carolina Academic Press. ^ "May I therefore succeed in purifying Fable, making her submit to reason and take on the semblance of History. But where she obstinately disdains to make herself credible, and refuses to admit any element of probability, I shall pray for kindly readers, and such as receive with indulgence the tales of antiquity." (Plutarch, Life of Theseus). Plutarch's avowed purpose is to construct a life that parallels the Life of Romulus that embodies the founding myth of Rome. ^ Morford, Mark; Lenardon, Robert J.; Sham, Michael. "Classical Mythology Tenth Edition". Oxford University Press. Oxford University Press. Archived from the original on 10 November 2014. Retrieved 31 October 2016. ^ Morford, Mark P. O., Robert J. Lenardon, and Michael Sham. Classical Mythology. 10th ed. Oxford: Oxford UP, 2014. ^ The theory, expounded as natural history by Aristotle, was accepted through the nineteenth century and only proven wrong in modern genetics: see Telegony. Sometimes in myth the result could be twins, one born divine of a divine father, the other human of a human sire: see Dioscuri. Of a supposed Parnassos, founder of Delphi, Pausanias observes, "Like the other heroes, as they are called, he had two fathers; one they say was the god Poseidon, the human father being Cleopompus." (Description of Greece x.6.1). ^ Rock "which had a hollow in it just large enough to receive these objects," Plutarch says. ^ Compared to Hercules and his Labours, "Theseus is occupied only with the sacred Entrances that are local to the lands of Athens" (Ruck and Staples 1994:204). ^ Plutarch quotes Simonides to the effect that the alternate sail given by Aegeus was not white, but "a scarlet sail dyed with the tender flower of luxuriant holm oak." (Plutarch, 17.5). ^ Ariadne is sometimes represented in vase-paintings with the thread wound on her spindle. ^ Noted by Kerenyi 1959:232 note 532. ^ Demetrius Phalereus was a distinguished orator and statesman, who governed Athens for a decade before being exiled, in 307 BC. ^ Plutarch. "Theseus". The Internet Classics Archive. Retrieved 17 January 2013. ^ Cooper, John M., ed. (1997). Plato: Complete Works. Associate editor, D. S. Hutchinson. Indianapolis/Cambridge: Hackett. p. 37. ISBN 0-87220-349-2. ^ Scholia on Iliad iii.144 and a fragment (#227) of Pindar, according to Kerenyi 1951:237, note 588. ^ Reported at Athenaeus, Deipnosophistae 13.4 (557a); cf. Kerenyi 1959:234 and note. ^ F. L. Lucas (2014). Ariadne. Cambridge University Press. ISBN 9781107677524. ^ "The Sword is Forged by Evangeline Walton". Kirkus Reviews. 1983. Retrieved 16 March 2016. ^ Zeitchik, Steven (24 March 2012). "Which dystopian property does The Hunger Games most resemble?". Los Angeles Times via Boston Herald. Boston Herald and Herald Media. Retrieved 24 March 2012. ^ TV Tropes – Recap: Myth Quest E 1 "The Minotaur"
Sideris, Athanasios, Theseus in Thrace. The silver lining on the clouds of the Athenian-Thracian relations in the 5th century BC (Sofia, 2015) presents new iconographical sources and examines the role of Theseus in the state ideology of Athens and in its gift-diplomacy with Thrace.